For several years the media have persisted in telling us that the U.S. “won” in Iraq because of the troop surge that Bush began in 2007 and Obama continued into 2011, when he announced a formal end to the occupation. However, this included maintaining 5,000 private security contractors and 16,000 State Department “civilian employees” there. Knowing their history of engaging in war crimes, he tried unsuccessfully to pressure the Iraqi government to grant them immunity from prosecution. …the surge was incapable of addressing, and barely pretended to face, the true conundrum of the invasion and occupation: any American-directed version of Iraqi “democracy” would invariably usher in Shia-majority dominance over a largely synthetic state. The real question no surge cheerleaders publicly asked (or ask to this day) was whether an invading foreign entity was even capable of imposing an inclusive political settlement there. To assume that the United States could have done so smacks of a faith-based as opposed to reality-based worldview – another version of a deep and abiding belief in American exceptionalism. Cui bono? Do you remember when the embarrassed Bush administration changed the title of the invasion to “Operation Iraqi Freedom” (OIF) after someone noticed the acronym formed by the letters of its original name, “Operation Iraqi Liberation”? Secret cables and reports by the U.S., Saudi and Israeli intelligence agencies indicate that the moment Assad rejected the Qatari pipeline, military and intelligence planners quickly arrived at the consensus that fomenting a Sunni uprising in Syria…was a feasible path to achieving the shared objective…In 2009, according to WikiLeaks, soon after Bashar Assad rejected the Qatar pipeline, the CIA began funding opposition groups in Syria. In August 2012, the U.S. Defense Intelligence Agency warned that the Muslim Brotherhood and Al Qaeda were “the major forces driving the insurgency. But Obama preferred a different narrative. All it took was an alleged massacre – by the old standby “gassing – weapons of mass destruction” – for him to threaten missile attacks on the Syrian government. The media happy complied. All Things Considered claimed that he “…has done everything he can to avoid another foreign military involvement, but he can’t avoid it after the widespread use of chemical weapons on this scale.” Chemical weapons? Were we really going down that rat hole once again? A year later, the U.S. reached further heights of hypocrisy when it demanded that Syria eliminate all chemical weapons by June 30, 2014. Around the same time it requested an extension for itself to 2023 of the U.N. Convention on Chemical Weapons, a treaty it had ratified in 1997. The Syrians had already proposed years earlier to get rid of these weapons. The Russians made a similar proposal, which Washington rejected. When the Syrians called Obama’s bluff and did remove them, Congress restrained direct intervention. Undeterred by public opposition, the administration gave the green light to the Saudis, who began to funnel massive aid to their Salafi jihadist surrogates. The U.S. itself was spending a billion dollars per year arming and training these “ moderate rebels”. Without this aid, Assad – for better or for worse – would have crushed the rebellion quickly. With it, the carnage increased, and so did the refugee flow. Let’s be clear (as clear as we can) about another thing. The world is experiencing the greatest refugee crisis since at least World War Two. Many thousands have drowned in the Mediterranean Sea. Literally tens of thousands of unaccompanied child refugees are wandering the streets of Europe. And the resultant backlash and scapegoating among Islamophobic Americans led directly to the fiasco of the 2016 election. We have Trump not despite Obama but because of him. This crisis has many causes. But Obama’s decisions to destabilize Syria and Libya (see below) were the major factors. Let’s be clear about this as well: his wars of regime change and his refusal to leave Afghanistan directly contributed to the growth of Al Qaeda, the Taliban and ISIS. The U.S. claim that it is waging a global “war on terror” is the biggest lie of the 21st century …In reality, the U.S. is the birth mother and chief nurturer of the global jihadist network …deployment of jihadists has become central to U.S. imperial policy…And, there is no question that “internal rivalries” do abound in the U.S. war machine, with CIA-sponsored jihadists attacking Pentagon-sponsored jihadists in Syria – the point being, the U.S. backs a wide range of jihadists that have conflicts with one another…the general aim of the Obama administration’s jihadist policy, now deeply in crisis: to preserve the Islamic State as a fighting force for deployment under another brand name, under new top leadership. The Islamic State went “rogue,” by the Americans’ definition, when it began pursuing its own mission…Even so, the U.S. mainly targeted top ISIS leaders for elimination, allowing the main body of fighters, estimated at around 30,000, to not only remain intact, but to be constantly resupplied and to carry on a vast oil business, mainly with NATO ally Turkey. We have no idea how many civilians have been killed in the massive bombings in Iraq and Syria, where the US military is often pursuing ISIS in the middle of urban neighborhoods. We only sporadically hear about civilian killings in Afghanistan, such as the tragic bombing of the Doctors Without Borders hospital in Kunduz that left 42 dead and 37 wounded …Pushed to release information about civilian deaths in drone strikes, in July 2016 the US government made the absurd claim it had killed, at most, 116 civilians in Pakistan, Yemen, Somalia and Libya between 2009 and 2015…The London-based Bureau of Investigative Journalism, which has tracked drone strikes for years, said the true figure was six times higher. Given that drones account for only a small portion of the munitions dropped in the past eight years, the numbers of civilians killed by Obama’s bombs could be in the thousands. …the President had in fact signed a secret Executive Order allowing such strikes to continue in Pakistan, directly contradicting his public stance. In June 2016 evidence also emerged that signature strikes were ongoing in Yemen as well, likely through a similar secret policy. The American military has failed to publicly disclose potentially thousands of lethal airstrikes conducted over several years in Iraq, Syria and Afghanistan…The enormous data gap raises serious doubts about transparency in reported progress against the Islamic State, al-Qaida and the Taliban, and calls into question the accuracy of other Defense Department disclosures documenting everything from costs to casualty counts. What the administration did “disclose” was the existence of yet another “other” – the “Khorasan group”, which CBS News called “a more immediate threat to the U.S. homeland.” It was worse than ISIS, which was worse than Al Qaeda, which was worse than the Taliban (even if they were all fighting each other). But when no evidence of this threat was offered, it quickly disappeared from view. …thought about another way, that “terror Tuesday” scene might not be from a monastery or a church synod, but from a Mafia council directly out of a Mario Puzo novel, with the president as the Godfather, designating “hits” in a rough-and-tumble world. 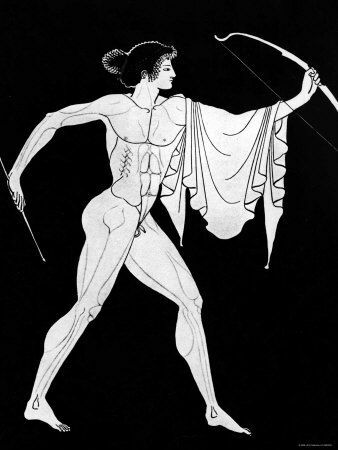 Apollo had reigned ever since our ancestors realized that they could harm each other, and minimize danger to themselves, by throwing rocks and then inventing spears, archery, catapults and guns. American pilots had destroyed inconceivably vast areas of Viet Nam in their B-52 bombers, where they’d been too high in the sky to even hear the explosions. It was merely another step in advanced battlefield technology to have men with joysticks in air-conditioned offices commanding drones to destroy people of color at wedding parties hundreds of miles away. And who better to serve as the face of this modern, unemotional carnage than the calm, detached, cerebral Obama? Could any strategy expert have invented a scheme more likely to create more enemies and extend more wars into an infinite future? At what point do we begin to ask: was this really the purpose? Tragedy or farce? In October 2016, Obama sanctimoniously warned that in the future “…you (could) end up with a president who can carry on perpetual wars all over the world, and a lot of them covert, without any accountability or democratic debate.” But he claimed that the accountability and transparency measures he was instituting would make that less likely. “By the time I leave here, the American people are going to have a better sense of what their president is doing.” Indeed. And though the administration claimed that the main fight was against ISIS, some of the CIA-backed groups were affiliated with Al Qaeda and primarily fighting against Assad. Meanwhile, lest we forget the crucial fact, ISIS was receiving most of its support from U.S. allies Turkey and Saudi Arabia. It is absolutely inconceivable that the Pentagon and the CIA were not aware of this. U.S. support for a particular group changed from one part of Syria to another. The Pentagon backed Kurdish YPG forces in eastern Syria but not the YPG in northern Aleppo. Indeed, the YPG north of Aleppo has attacked U.S.-backed forces. In January 2017, American airstrikes “mistakenly” attacked Syrian army positions, killing 62 soldiers. For an analysis of the complex machinations and internal backstabbing that led Russian U.N. ambassador Vitaly Churkin to ask, “Who is in charge in Washington? The White House or the Pentagon?” see Gareth Porter’s article. ISIS did not exist when President Obama took office and put Hillary Clinton in charge at Foggy Bottom. His (and her) regime change in Libya and massive, terroristic pivot to Syria “created” ISIS…the U.S. did not reject the jihadist death cult that became ISIS; rather, the Islamic State divorced itself from the U.S. and its European and royal allies. Yet, it still took the Russian intervention in Syria in September of last year to push Washington to mount more than token air assaults against ISIS. I hear your voice: Perhaps Obama ended up as a war criminal, but he began with such high ideals. Let’s move on.